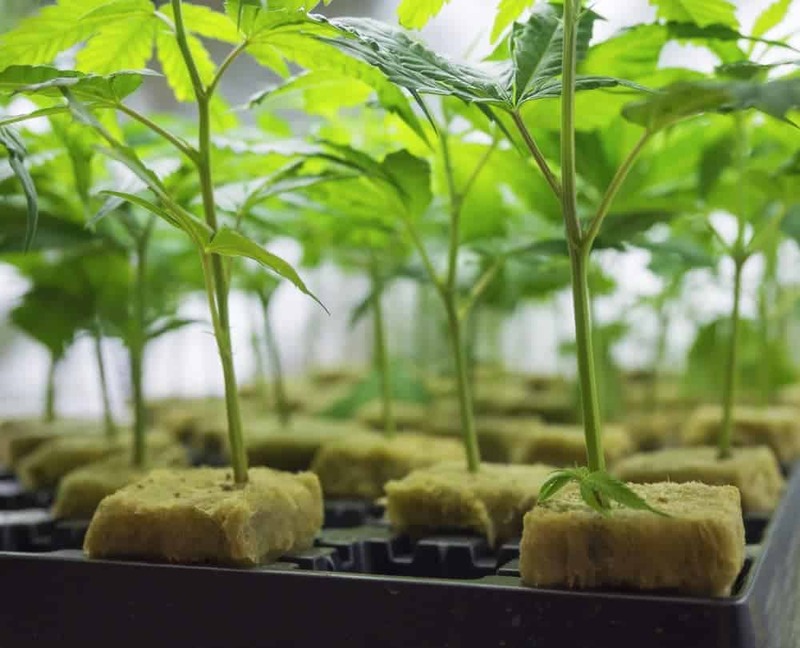 This easy tutorial explains how to grow cannabis from seed to harvest. Learn how to take care of your plants with step-by-step instructions! The 2016 gardening season is booming in North America, and it’s high time to start some tiny seeds that can grow into potent plants, says Jorge Cervantes, veteran marijuana cultivator and author of The Cannabis Encyclopedia. Below, Cervantes shares his process for germinating seeds into healthy sprouts. 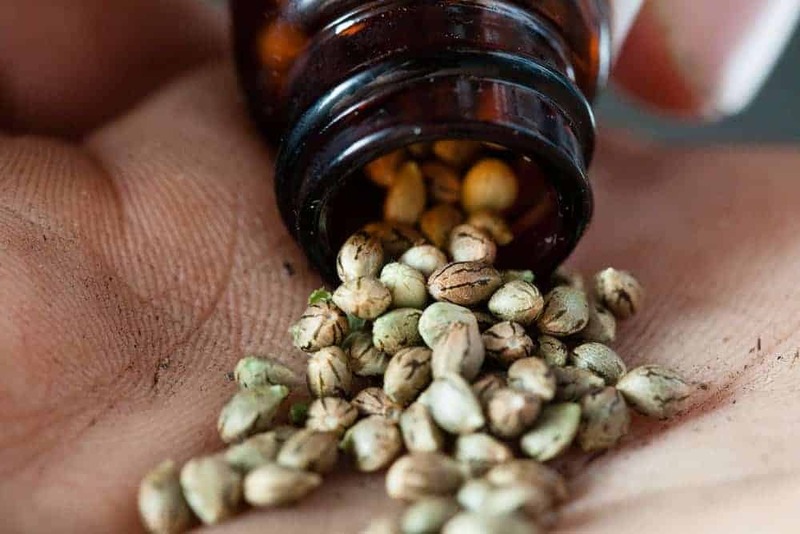 Photo: Cannabis seeds. Via: Eric Limon | Shutterstock. 1. Soak seeds overnight in a glass of plain water. They may float on the surface at first but should sink to the bottom in a few minutes. Make sure seeds get good and wet so that water penetrates the outer shell and growth is activated. Do not let seeds soak for more than 24 hours, or they might get too wet, suffer oxygen deprivation, and subsequently rot. 2. Remove seeds from glass of water. Pour water out onto two paper (or cloth) towels on a dinner plate. Fold the towels over the seeds to cover them. 3. Drain the water from the dinner plate by tipping it to the side. 4. Place the seeds in a warm location (70°F–80°F; 21°C–27°C), making sure they are in darkness. Some gardeners go so far as to set the plate in a vertical position (so taproot grows downward). The seeds can also be set on a grate for drainage and air circulation. 5. Check moisture level of towels several times a day, watering once or twice to keep them evenly moist. DO NOT LET THE TOWELS DRY OUT! Let excess water drain away freely. The paper or cloth towels will retain enough moisture to germinate the seeds in a few days. Each seed contains an adequate food supply for germination. Prevent fungal attacks by watering with a mild 2 percent bleach or organic fungicide solution. 6. In a few days, seeds will sprout. 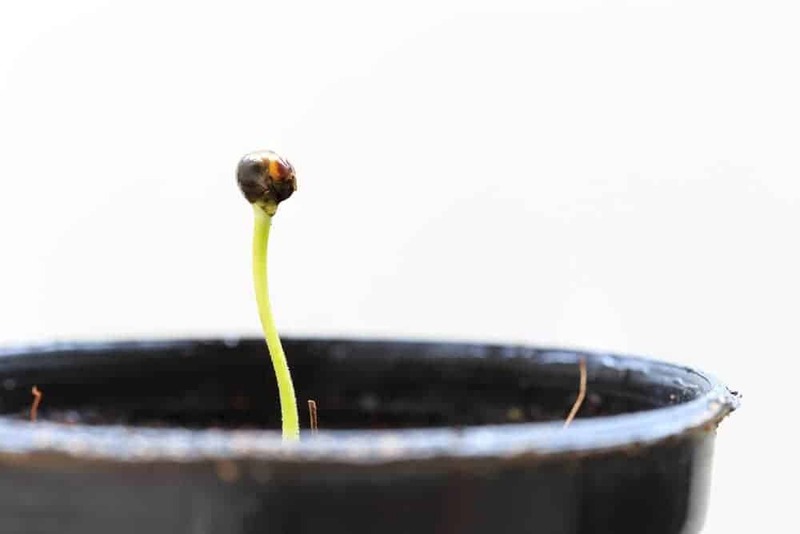 Once seeds have sprouted and each seed’s white rootlet is visible, use tweezers to carefully pick up the fragile, germinated seeds and plant them. Do not wait for the white rootlets to grow more than 0.25 inches (1 cm) before planting, or growth could slow. Plant each germinated seed with the white root tip pointing downward. Take care not to expose the tender rootlet to prolonged light and air. Cover germinated seeds with 0.25 to 0.5 inches (1-2 cm) of fine, moist planting medium. Photo: Cannabis seedling. Via: suthiphong yina | Shutterstock. Over and under-watering are the biggest obstacles most gardeners face when germinating seeds and growing seedlings. Keep the soil uniformly moist but not waterlogged. Do not let the growing medium’s surface dry for long. Setting root cubes or planting flats on a grate allows good drainage. A shallow flat or planter with a heat pad underneath may require daily watering, while a deep, 1-gallon (3.8 liter) pot will need watering every three days or more. A properly watered flat of rockwool cubes needs water every three to five days when sprouting seeds. When the growing medium’s surface is dry (0.25 inches [1 cm] deep), it is time to water. Remember, there are few roots to absorb the water early in life and they are very delicate. Photo: Setting root cubes on a grate allows good drainage. Via: Mr. Green | Shutterstock. Some seeds have a very hard outer shell (testa) and are difficult to germinate. Such testy cases can be softened or scarified to allow water to penetrate. To scarify, line a matchbox with a piece of fine-grain sandpaper or emery board. Put the seeds in the matchbox and shake for 10 to 15 seconds. Remove the seeds and make sure they have been scuffed a bit. Just a little scuffing will allow water to enter and set germination in motion. 1. Set seeds in a matchbox with an emery board or sandpaper on the bottom. 2. Close seeds inside the matchbox. 3. Shake matchbox for 10 to 15 seconds to scarify the seeds. This is an excerpt from The Cannabis Encyclopedia by Jorge Cervantes, world-renowned indoor, outdoor and greenhouse cannabis cultivator. A veteran marijuana grower, Cervantes brings 30 years of experience traveling, studying, and writing to bear in his best work to date. SeedSupreme Seed Bank has long been one of the best sources for a large international variety of top-shelf, top quality cannabis seeds.